Mitraria coccinea typically grows as a small semi-hardy shrub. This plant was growing at windswept Ilnacullin Gardens in Ireland. The terms woody herb, subshrub and shrub have been ambiguously used to characterize certain members of Gesneriaceae, but a clear categorization is not possible. Lignification may be so slight that the shoots remain soft and flexible. In such cases it is difficult to speak of a proper shrub. Examples of shrubs or subshrubs are found in Gesneria, Paliavana, Vanhouttea, Bellonia, Solenophora, Besleria, Cyrtandra and Mitraria. Typical shrubs are branched, preferably at the base. Often, however, a plant has a distinctly woody stem that remains unbranched and bears a tuft of leaves at the apex. These plants can be referred to as single-stemmed or monaxial shrubs (e.g. Rhytidophyllum). While shrubby plants are fairly common in the Gesneriaceae, they are rarely cultivated due to their size and thus are not well known. Cyrtandra species may reach a height of four or five meters and thus may be termed arborescent shrubs or small understorey trees. 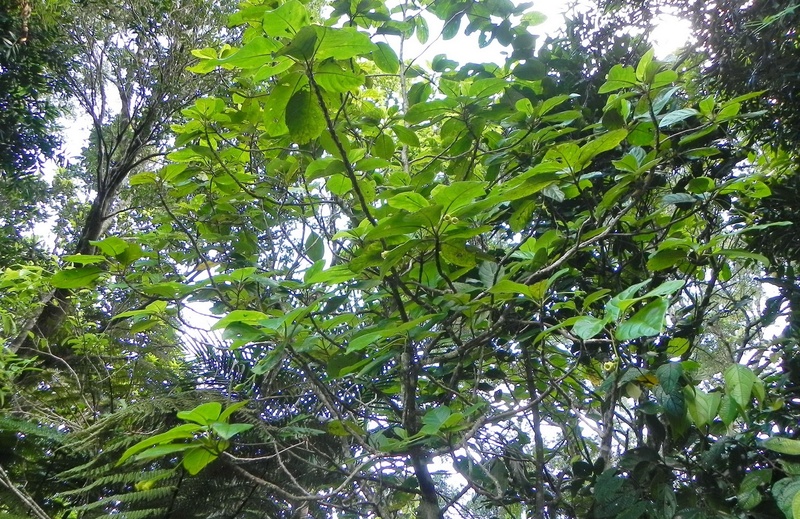 The largest trees are found in the Coronantheroid Gesneriaceae (Gesnerioideae-Coronanthereae), reaching a height of 15 meters and more: Coronanthera, Depanthus (New Caledonia) and Negria (Lord Howe Island in the SW Pacific). The latter has a strong trunk and spreading branches, but the wood is light and brittle as in the other (small) trees and shrubs of Gesneriaceae. Columnea microcalyx typically grows high above the forest floor, rooting epiphytically into moss and organic matter on trees. Its pendant stems replete with pink blossoms make a beautiful, often distant, sight. Especially in the neotropical Gesneriaceae there is no sharp boundary between epiphytes, climbers and lianas. In most cases germination takes place high on a host tree. Many species of Drymonia, however, root in the ground and their wiry stems climb trees, often producing elongate horizontal lateral branches. In the paleotropics, the only genus consisting (with few exceptions) of true climbers rooting in the ground is the Malesian genus Agalmyla. There are no Gesneriaceae with twining vines or tendrils. This type is found mainly in the neotropical Gesneriaceae, especially in the Episcieae (e.g. Drymonia, Nematanthus, Columnea). 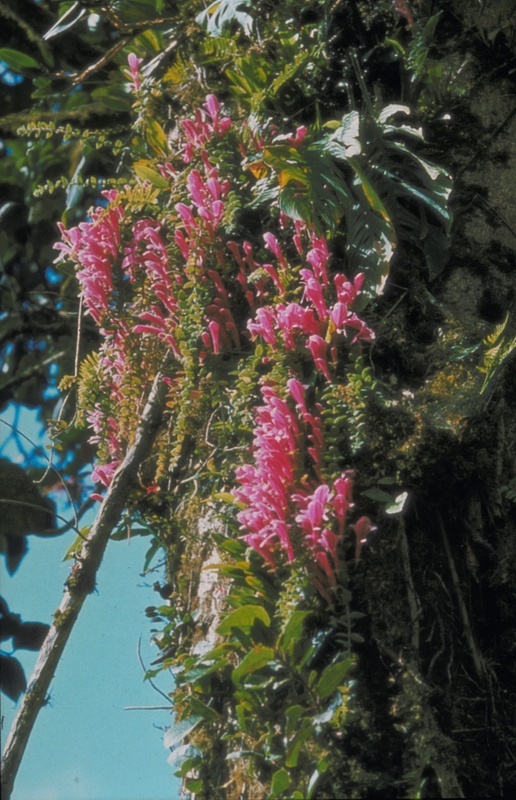 Within Columnea, a wide range of different epiphytic growth patterns can be observed. One group has (sub)erect shrubby stems and branches with opposite equal leaves, another group has spreading stems with strongly unequal leaves arranged in a plane, and a third group has pendulous stems with the ± equal leaves often arranged in a single plane. Variations are found in many details and have not been studied properly so far. Epiphytes are rare in the Old World Gesneriaceae. 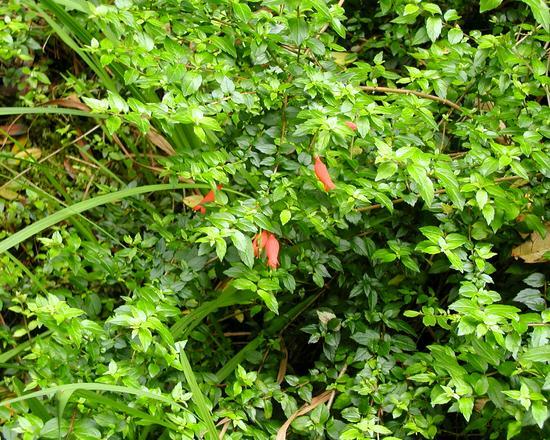 The main epiphytic genus is Aeschynanthus, which has many quite variable species. With the exception of a few semi-terrestrial species growing on tree stumps or rocks, all Aeschynanthus are epiphytes. Otherwise, only Lysionotus and Loxostigma include epiphytic species.